Shipman (population 655) is located in southwestern Illinois in the southwestern portion of Macoupin County. Illinois Route 16 is the main roadway leading to and from Shipman. A branch of the Macoupin Creek flows to the west of of Shipman. The Illinois Central Gulf Railroad runs through Shipman as well. 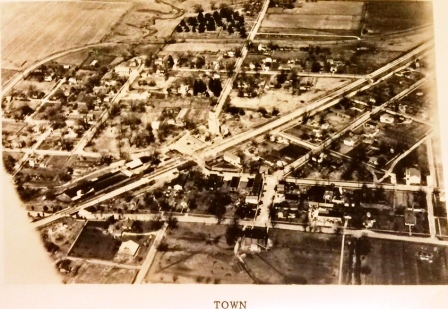 A town of note near Shipman is Alton located about 15 miles to the southwest. The history of the town of Shipman and its educational progress are in need of research. It is thought that Shipman probably started a school system and subsequent high school in the late 1800s, possibly even the early 1900s. Shipman High School definitely served the community through the 1940s. This is where we found a discrepency. We do know that Shipman High School joined its neighbors of Brighton, Medora, and Piasa to create the Southwestern School District. According to the Piasa Southwestern School District website (www.piasabirds.net) the consolidation took place with about 20 area country schools after the 1947-48 school year. 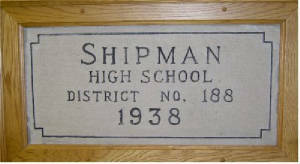 However according to the IHSA website (www.ihsa.org) Shipman High School won a District title in boys basketball in 1953. 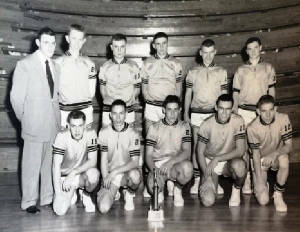 The IHSA website also shows that Brighton won a District title in baskeball in 1955. "The first combined High School classes were held in a Reno's Garage in Piasa. This was shop and ag classes. This started the fall of 1949." The high school districts did not combine into one school until after the 1954-55 school year. Shipman is still home to an elementary school for grades K - 6 as part of the Southwestern School District. The original Shipman High School building is now home to Shipman Grade School. Shipman School nickname: the "Pirates"
Shipman High School competed, and won IHSA hardware, in the sports of boys basketball and boys baseball. Boys fast-pitch softball was also offered in the 1940s. It is quite possible that track & field was at one time offered. We are searching for the Shipman school fight song as well as its conference affiliation. The Shipman High School boys basketball team brought home two District titles during its existence. Unfortunately the coach's names and team records of these and other great Shipman teams are not available. Piasa Southwestern faculty member Matt Hasquin offered this site to us and we suggest you view and help Matt with the missing information. Matt was assisted in his research by Brian Hanslow. A great job done in remembering the past of Piasa Southwestern's "feeder" schools. 1940-41 Medora District Tournament Coach's name & record needed. Hillsboro beat Gillespie in title game. *Final basketball game for Shipman High School boys. 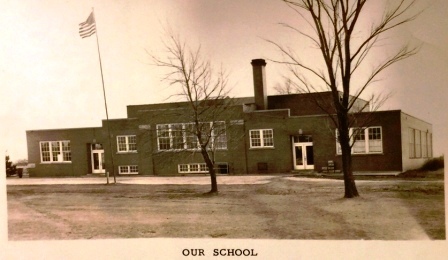 School consolidated to form Piasa Southwestern High School in the summer of 1955. The Shipman Pirates competed in softball as well. 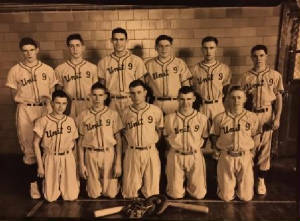 The team of 1952-53 won the conference championship by beating Bunker Hill HS in the title game.